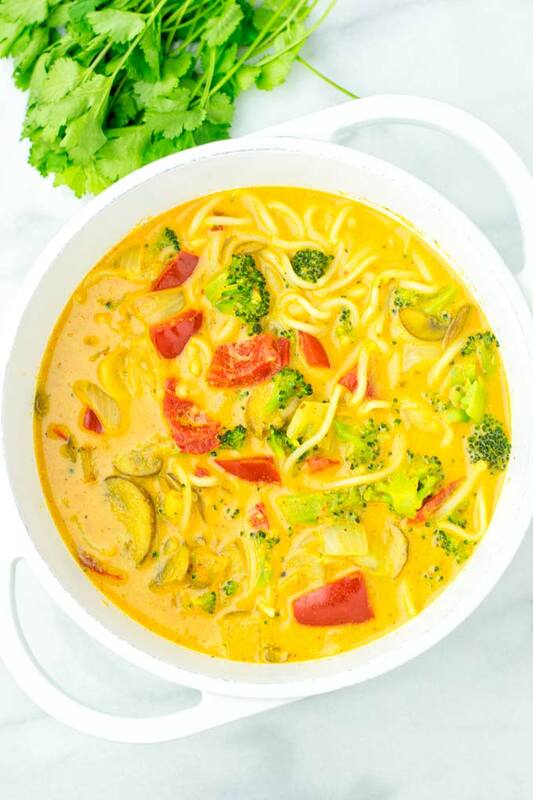 This Coconut Curry Noodle Soup will be an instant hit for your 20 minute meals. Kids friendly this one is seriously among the best recipes that the whole family will love and you will make again in no time for meals to go. No one would ever guess this curry recipe is naturally vegan. It makes a lovely addition to all one pot meals like this One Pot Chili Mac and Cheese or the Moroccan Chickpea Lentil Soup (Harira). 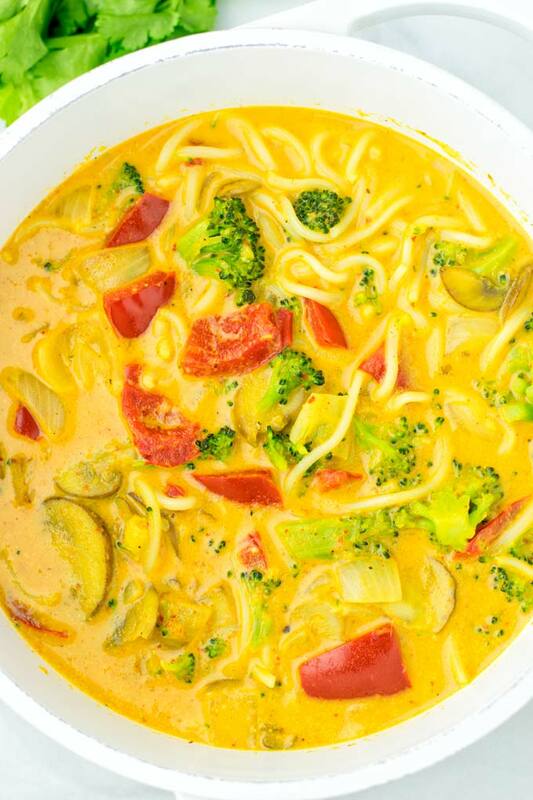 For more easy recipes and another vegetable curry use the search bar and keep your craving mile high and fresh. 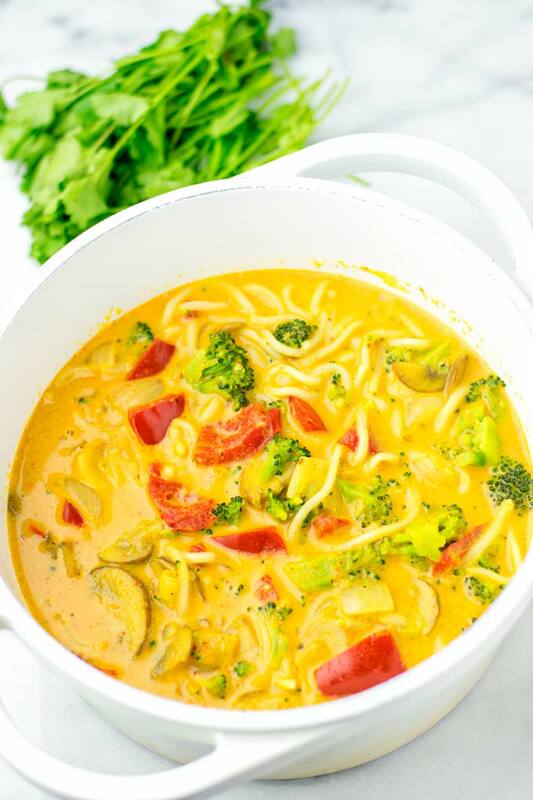 Trust me friends when I say once you’ve tried this noodle recipe you can be sure it’s: creamy, rich in flavor, an amazing find for quick dinner ideas, super easy to make in one pot, infused with a rich coconut curry sauce. It is everything you need for easy dinner recipes. First in a large pot heat a bit of oil (or vegetable broth, if you prefer oil free cooking). Add minced garlic and fry it for around 3 minutes. Then transfer the mixed vegetables (broccoli, mushrooms, bell pepper, carrots, onions) and fry all for 2 minutes more. Finally add Thai yellow curry paste, optional fenugreek and curry powder. Season with salt and pepper to taste before the rice noodles, coconut milk, and vegetable broth. Cook for 8 minutes more, and serve in bowls. This makes such an amazing and delicious 20 minute meal making easy dinner recipes a breeze. That means you can have your dinner ready in no time and the whole family will enjoy this kids friendly recipe. Also it’s just good for meal prep, dinner, lunch, working lunch. Always great for lunch box ideas for adult and kids, dinner recipes for two. Oh, and any leftovers will reheat beautifully. 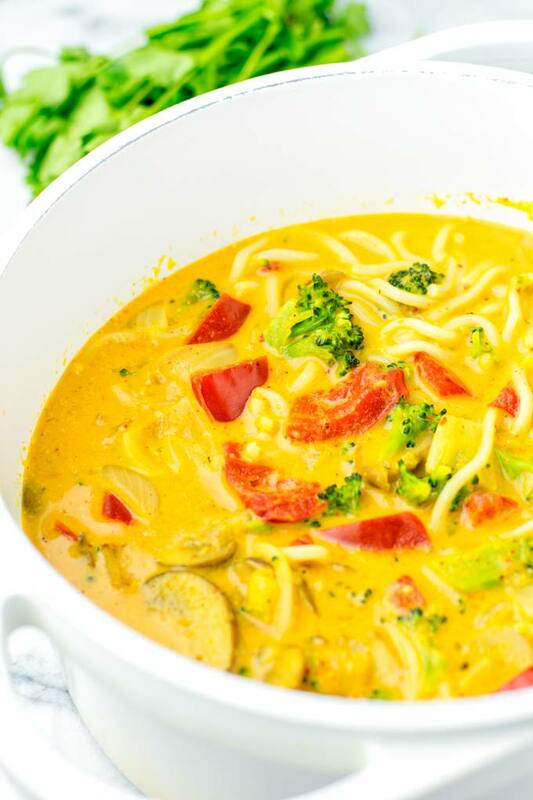 It is super versatile and for everyone a wonder Thai coconut curry recipe. 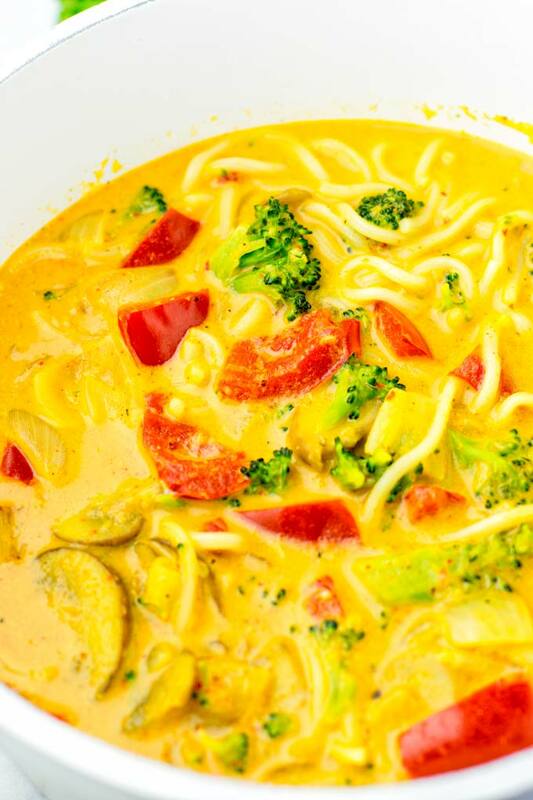 One tip for you: if you’re sensitive to heat, scale down the Thai yellow curry paste to your linking. Start with 2 tsp and go from there spoon by spoon. You should also skip the optional curry powder, or scale it down. If you plan meals ahead, I got you covered: You can prepare this noodle soup up to 5 days in advance. Just imagine, you can eat the whole week from it. Plus the flavors taste even better. If you’re looking for side dishes to serve with this soup, think of rice, quinoa, potatoes, or maybe a naan like this Easy Roasted Garlic Naan. Looking for healthy frozen meals? 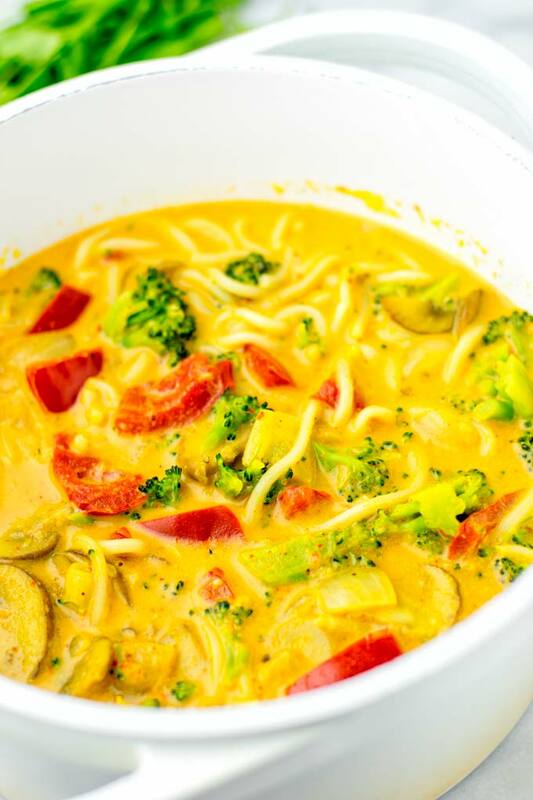 Then this noodle soup is just right for you. Make sure before freezing that you cool it completely. If you need to know more, check this guide about “Freezing Curry“. 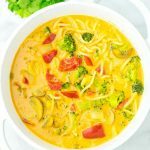 If you try this Coconut Curry Noodle Soup, tag me on Instagram or Facebook. In a large pot heat a bit of oil (or vegetable broth, if you prefer oil free cooking). Add minced garlic and fry it for around 3 minutes. Transfer the mixed vegetables (broccoli, mushrooms, bell pepper, carrots, onions) and fry all for 2 minutes more.